The directors of the latest Avengers film have pleaded with fans not to reveal plot details after some footage and images reportedly leaked online. "Please don't spoil it for others, the same way you wouldn't want it spoiled for you," wrote siblings Anthony and Joe Russo in an open letter. The leaked footage appeared on social media this week before being removed. Avengers: Endgame, a follow-up to last year's Avengers: Infinity War, opens in the UK on 25 April. 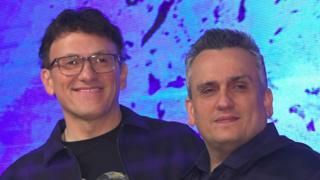 In their letter to "the greatest fans in the world", the Russos said they had worked "tirelessly" to deliver "a surprising and emotionally powerful conclusion to the Infinity Saga". "Remember, Thanos still demands your silence," they continued - a reference to the film's main villain, a genocidal warlord played by Josh Brolin. The brothers' letter was accompanied by a #DontSpoilTheEndgame hashtag that comes with its own customised 'A' emoji. A similar plea was made before the release of Infinity War, which (spoiler alert) ended with many of the characters being wiped out. Endgame sees the surviving heroes, among them Robert Downey Jr's Iron Man and Chris Hemsworth's Thor, embark on a mission to "avenge the fallen". Reviews are embargoed until 23:00 BST on 23 April - just hours before the film arrives in cinemas in some countries.